Sandhurst Joggers would like to offer you some tips before you join us, especially if you have never run before. Firstly, if you feel out of shape, or you are recovering from an injury or worried about an existing condition, ask your GP before you start running. If you want to take running seriously then before you start, we would suggest you get advice on choosing the right footwear. Places like Alton Sports or Sweatshop will assess your feet and running gait and find the right trainers for you. It is important, whatever your level of fitness, that you ease yourself into running and build up gradually to avoid injury. There are many training plans available, but one of the most popular is the NHS Couch to 5k Plan. Sandhurst Joggers have our own group called Pure Beginners. You may like to join our Pure Beginners course that commences every April and July. Once you have mastered running for a constant 30 minutes you could then progress to the Tuesday Club runs ,where we have Run/Walk and other pace groups. These are free timed 5km runs which take place in lots of local parks every Saturday at 9am. Nobody minds if you are slow and run/walk or even walk the whole way – you just need to register with them first. 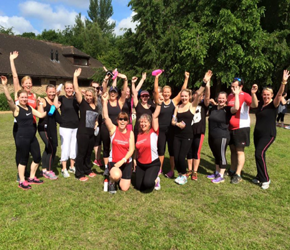 There are nearby parkruns at Bracknell, Frimley and Rushmoor near Farnborough and Sandhurst Joggers members are regular runners at these events. Finally, if you are running on dark evenings then we would recommend wearing bright or hi-vis clothing and possibly carrying a small torch or head torch. Stores such as Alton Sports, Sweatshop, Sports Direct and Decathlon, as well as online outlets, sell suitable bright clothing that will help to keep you seen and comfortable.